Come on in! 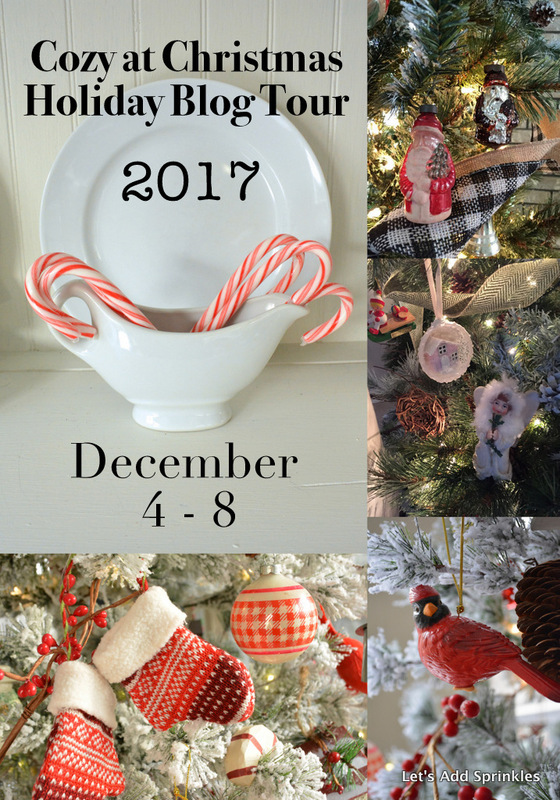 I'm delighted to participate in the Cozy at Christmas Home Tour organized by Katie at Let's Add Sprinkles. We'll start in the family room. 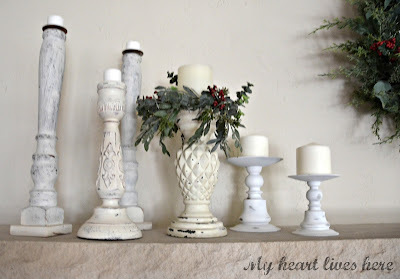 The mantel is very calm and quiet for Christmas this year, just a combination of whites and creams with a little greenery thrown in. Life tends to be hectic in December. We like our home to be a peaceful place to retreat to. 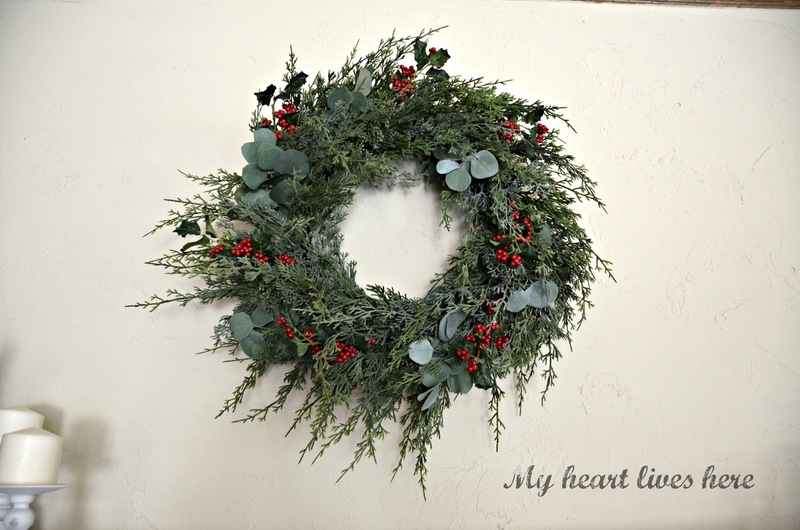 The wreath is a Hobby Lobby find. I kinda love it. I'll show you the tree both ways: lights off and then lights on. On the Christmas tree, I used burlap ribbons in muted tones and added white berry picks instead of my usual red ones. The effect is almost like snow falling among the Christmas ornaments. This is good, because there is sure no snow to watch falling outside in North Texas this week. 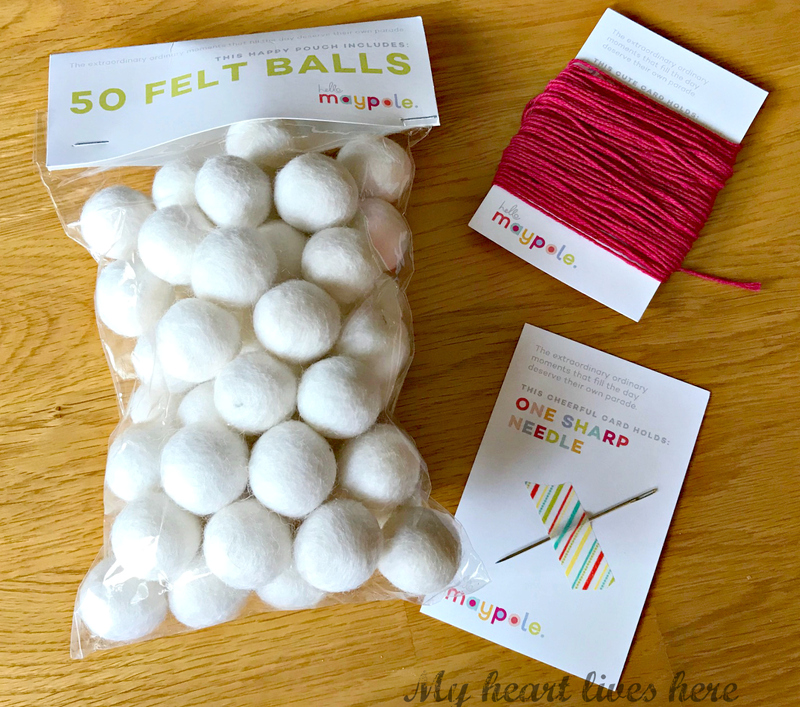 I recently discovered a fun and easy craft, stringing felt balls. If you can thread a needle, you can make a felt ball garland. (Even if you can't thread a needle, surely you can get someone who can read the tiny directions on a cake mix box to do it for you.) The hardest part of this little project is keeping the string from tangling. Well, if you have a dog, there may be another consideration. Lexi, the dog we adopted six months ago, was fascinated while watching me string the garland. She loves to bring us old tennis balls from the backyard on a daily basis. These balls must be from the previous homeowner's dog. We've lived here for over four years. We do buy her new ones, but she likes to show us what she can find. She is also a little crazy about playing fetch. I was afraid she might try to retrieve the "balls" on the tree, but so far, so good. Hopefully, we won't come home to a horizontal Christmas tree one of these days. 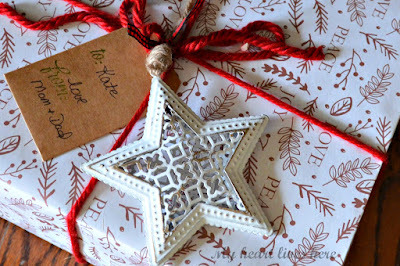 This year, I'm adding some cute but inexpensive Christmas tree ornaments when wrapping my daughter's gifts. She is graduating from college and wanting to get her own collection started. These are from World Market. 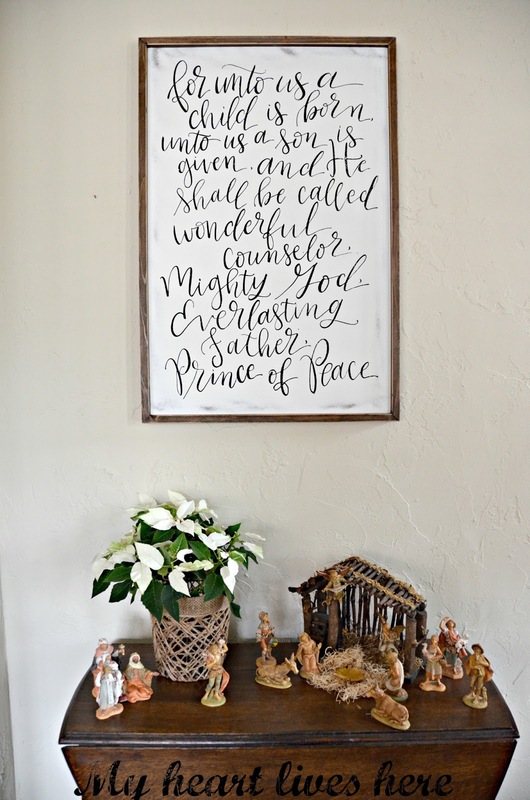 This sign feels just right hanging above our nativity. I purchased it from Glory Haus when I shopped at the Nutcracker Market in Houston. I have no affiliation with this shop, but they sure have some delightful things. When I brought this chest for the entry hall home from a consignment store, I imagined a beautiful Holy Family on it for Christmas. After some searching, I treated myself to this one. Each time I look at it, I feel peaceful, happy, and content. This is the family that Christmas is all about. I hope you'll stop by all the other wonderful blogs on the tour. Eilis I adore the light color palette. I still need to get to Paul Micheals. That greenery is fabulous. I MUST know where you found the felt balls. It was such a joy to see your yesterday. I wish I could of heard more about your recent travels. Soon, I hope. Thank you! There is a beautiful florist called Bunches in my area. I bought them there. Elis, I love your wreath. What a wonderful way to start your daughters ornament collection. I'm going to have to try the felt balls. So fun to be sharing this tour with you! Love your calm and cozy color scheme! The tree is beautiful! It's beautiful. Our dog does the same thing. She found an old dirty plastic Easter egg once. Your tree is darling. I love the pompom garland. The banister is beautiful. Thanks for being a stop on our tour. It's a wonderful stop for sure. Thanks for putting this tour together, Katie! Eilis, I love the beauty of your home, especially the entryway. The garland is wonderful on your stairway, and I'm hoping to find time today to click on that link and see what else they have. Thank you for sharing your beautiful home with us today. Wonderful to meet you yesterday! Everything looks so pretty and I want to go string some felt balls! So cute. I've been on the hunt for years for a special manger scene for my house and have had no luck. One of these days I'll find one as beautiful as yours. Merry Christmas. So glad to be on this tour with you. Hi Cindy, honestly I found it on Amazon! Thank you so much, NanaDiana! Eilis, your home is so pretty and inviting. I love the way the light comes in on your pretty hardwood floors as you enter. Beautiful stairway! Thanks for taking us on a tour. Everything is festive and cozy! You are clever to add the ornaments to your daughter's packages to start her own collection. I shared some tartan balls in my post today. They were some of the first ornaments I bought for my tree right out of college. That was a long time ago, so now they are treasured little memories of those years. Merry Christmas! Sarah, I love to unwrap our oldest ornaments each year! They bring back such happy memories. 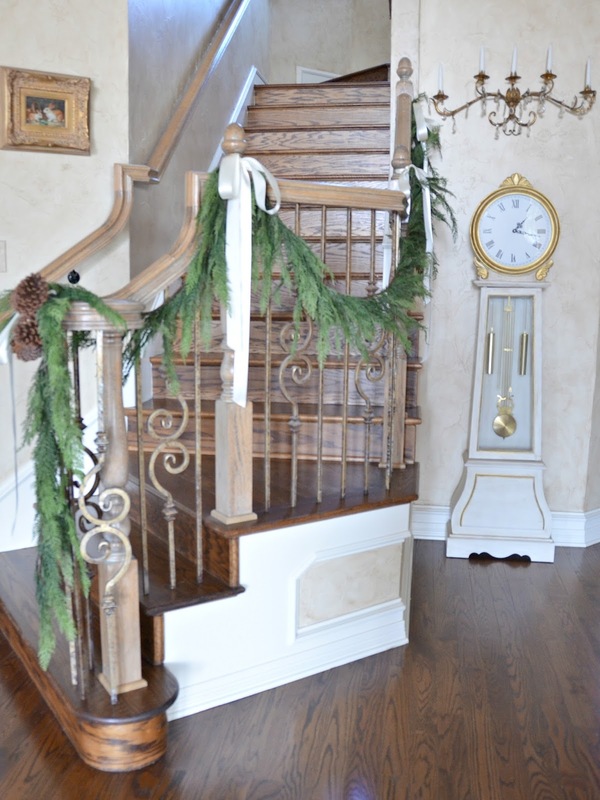 Thanks for stopping by..
Eilis, your home looks beautiful for Christmas. 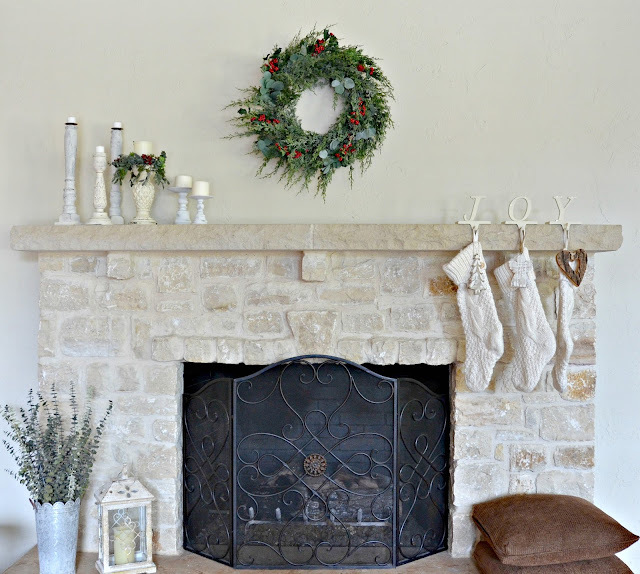 I kinda love that wreath over the mantel too. ;) The World Market tiny stockings are adorable. 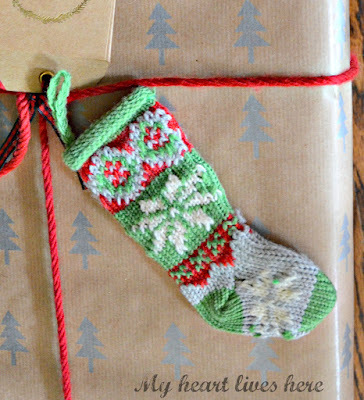 I bought something similar - can't remember where - and strung them as an Advent calendar. 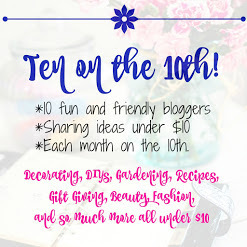 I like the idea of using as trim and gifting to your soon-to-graduate (yay!) daughter. 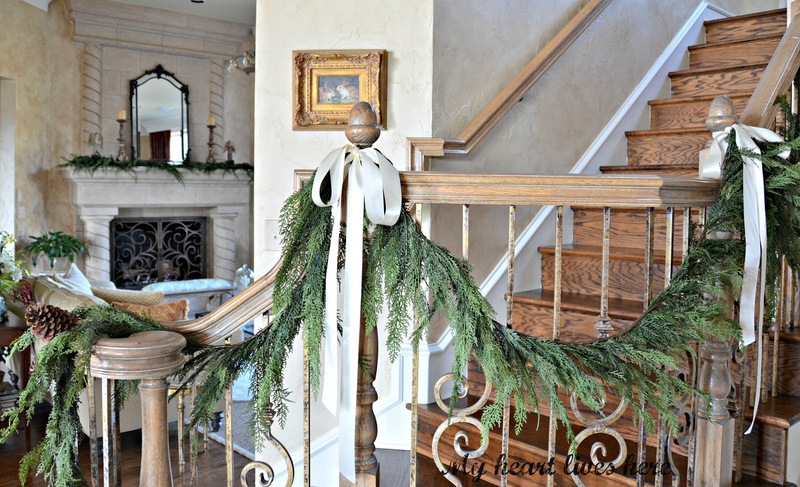 That stairway garland is gorgeous, and has me thinking hard on it. I've used the same garland trim for over 10 years now, storing and draping very carefully. It's just beginning to show its age (like me), and that draping cypress would be so pretty to mix and fill. The entry console with Nativity - very nice too. Thanks for sharing your home, and I hope you enjoy your holidays. 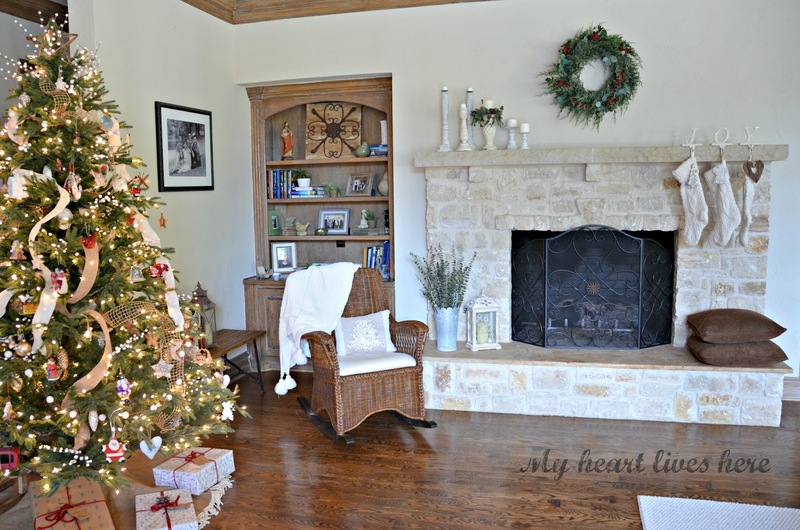 Ellis your home is elegant and cozy for Christmas! I love your Hobby Lobby wreath! It looks like real greens. Your nativity is so beautiful. I hope you have a Merry Christmas! 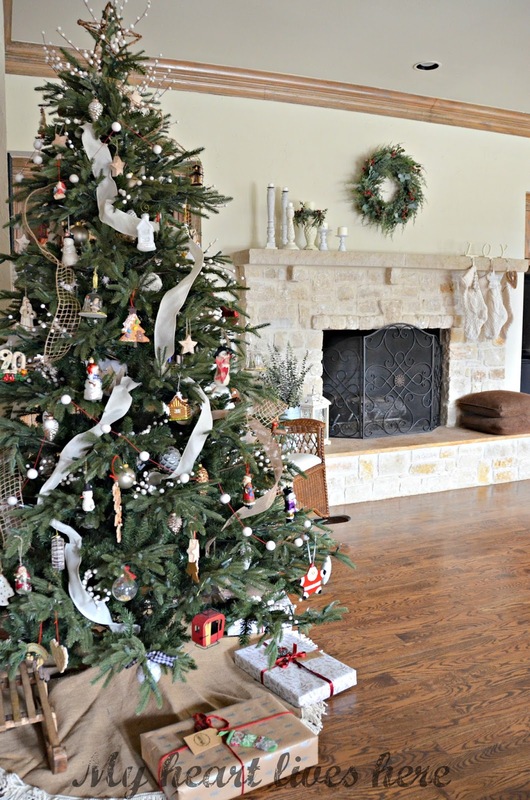 Your home is just beautiful decorated for Christmas. I am swooning over that gorgeous clock by the stairs! I hope you have a very Merry Christmas! Eilis- your home is just lovely and I know exactly how you feel and enjoying calmer decor at Christmas. I love your garland on your beautiful staircase. I hope I can meet you all face to face some day! Your new home is coming together so beautifully! Maybe the Lone star girls need a field trip to NM to meet up with you! Love your peaceful decor. The garland looks so real - I'd definitely say it was worth the cost! I chuckled about your dog and the balls. Amazingly, our cat has left the tree alone this year. Hoping your pup leaves yours alone. Ahh, just so pretty. You really have created a calm and beautiful retreat for your family. The softer colors are wonderful. Love your new sign. 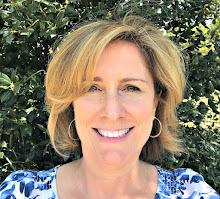 Eilis, Your home is cozy and calm. Your tree is stunning with and without the lights on. All your decorations are tastefully appointed. I love your chest with your special nativity and the heart rock. Bonnie, I notice that you and I share a love of nativities! Very beautiful and peaceful Eilis! I do love felt garlands and that faux greenery is gorgeous!! I thought it was real. 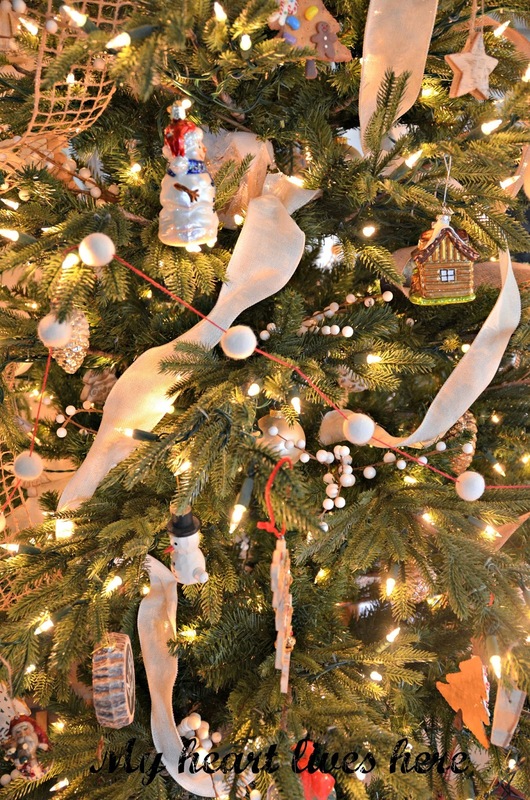 Your tree is beautiful and what a fun way to help your daughter start her own ornament collection. I love your sign and beautiful nativity too!! Your home is so beautiful! 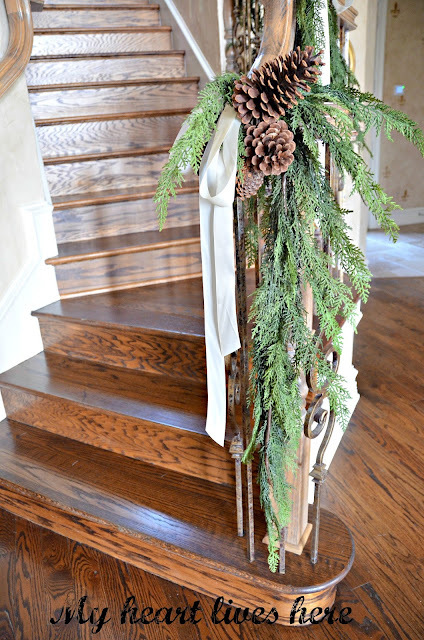 And thanks for the idea on the garland -- that looks fun and simple and I may have to do one of those just because I can. (Love the cake mix connection with needle threading!) The tree is perfect and so, too, is your mantle. Thank you for stopping by, Jeanie! Your cozy and calm Christmas decor speaks to my heart. My cat has decided the tree skirt is her newest bed. She has rearranged the fabric, and I see her napping in it during the day. :) Our animals are truly members of the family with a mind of their own. LOL Judith, I thought about getting one of those faux fur tree skirts, but I knew our dog would try to sleep under it. Your soft and gentle Christmas is so lovely. Of course your home is gorgeous any time of the year! Great to see you this past week! Eilis, I love your Christmas decor! My favorite is your Christmas tree! So very pretty! Thank you for sharing. Have a Happy Holiday Season! It's gorgeous at your house this holiday season. 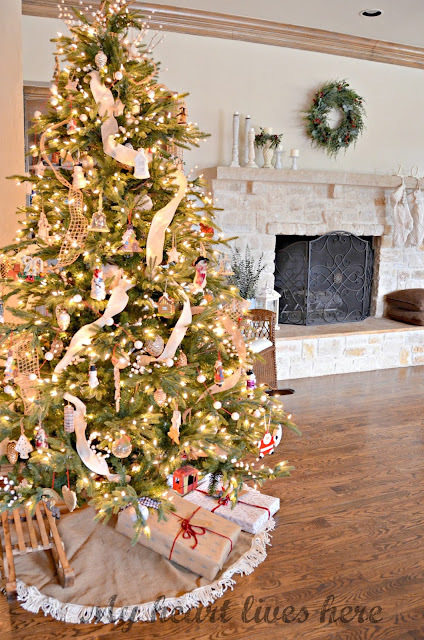 What a great idea to make your home a calm retreat amidst the hustle and bustle of December! Everything looks beautiful. 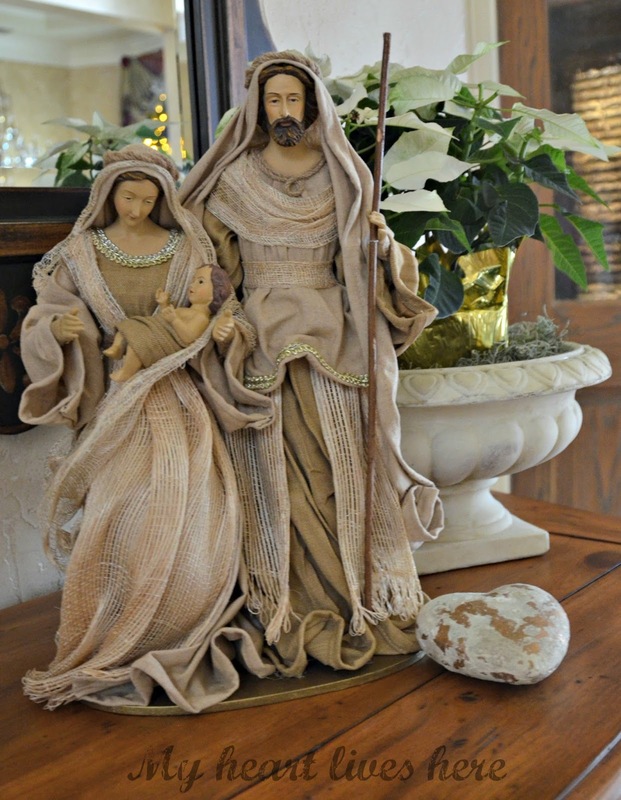 My favorite thing may be the beautiful Holy Family on that antique dresser, but it's hard to choose a favorite. So lovely! I really enjoyed seeing your calm and simple Christmas decor. Your tree is beautiful! Such a beautiful home tour! Thank you so much for sharing at Home For Christmas link party! Love your garland! Your home is so inviting and cozy! 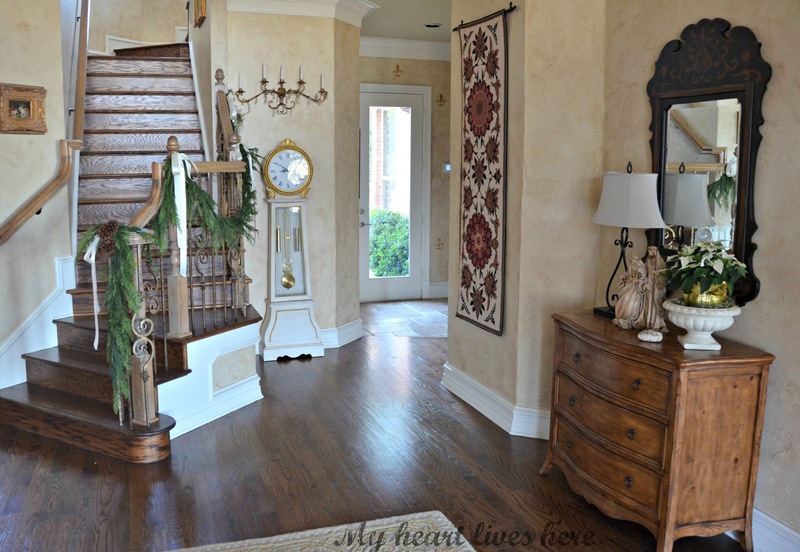 Love your staircase and so glad to be on this bloghop with you! Happy New Year!